I was sick and tired of these no maintenance watches. I wanted a watch I could fuss over and the Classique Grande Complication fits the bill perfectly. Having to manually wind this watch every day and adjusting the time every couple of weeks or so at time.gov is a dream come true. As an added bonus, I tossed this beauty on my American Airlines Platinum card and got double miles!! I booked a round trip first class flight to Paris thanks to my Tourbillion purchase. Life has unexpected surprises when you own a timepiece like this! The men's Classique Grande Complication watch features a handsome 18-karat rose gold case with a skeleton dial and Tourbillion carriage at 6 o'clock. 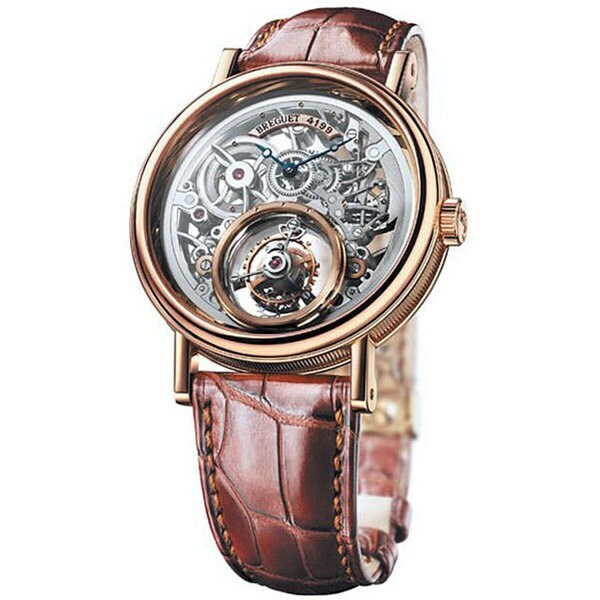 This exquisite timepiece from Breguet is finished with a brown leather strap. This watch is powered by Manual Hand-Wound mechanical movement which means the winding of the spring occurs only when the wearer winds the watch. The watch must be wound every day in order for the watch to work properly. It is also important to adjust the time every few weeks as manual movement can gain or lose a few minutes per month. I was going to purchase this watch. I went to the checkout though, and they wanted to charge me 5 dollars for shipping. I was going to buy this watch but then it hit me, I can buy a house for this price. My wife purchased the exact watch for me..they quality of this piece speaks volume and the fitting is AWESOME!! I would recommend this time piece on all levels! I had this watch for 5 years and love it. Was totally surprised when my employees bought me another one. Great looks and wonderful time keeper!!!!!!! "The name 'Classique Grande Complication' implies that the watch has several time-related displays. What are they ? The tourbillion is a time-keeping complication." Hello Watchin01, this has hour, minute and second functions. Thanks for shopping with us! "Do you accept bitcoin? I can't find the bitcoin button anywhere." Hello joesmith, yes, we accept bitcoin. It will become an option during checkout. Thank you for shopping with us! Hello Scott, we do apologize, we do not accept cash payments. Thank you for shopping with us.